In the men's shirt making course I took in the Fall of 2012 at FIT, I learned a flat fell seam treatment I had never heard of before which I will detail below. The sleeve for a man's shirt is installed flat, not in the round. So once the sleeve cap is attached to the garment, you must sew the garment side seam and sleeve seam. 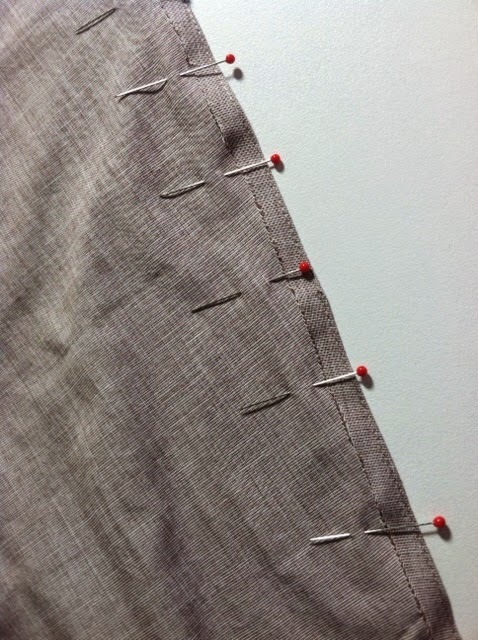 You start sewing this seam from the bottom/hem part of the shirt up all the way through to the sleeves. The trick is how to sew a flat fell seam in a sleeve which will now be closed. Seam allowances are 1/2 inch. 1. At the underarm area, fold up toward the right side 1/4 inch and place 3 pins. Press in between the pins. Remove the pins. This is just to give you a little more control and precision in this area. For the rest of the shirt edge, you can just fold under at the sewing machine 1/4 inch using a 1/4 inch foot as a guide as you edgestitch along the fold. IMPORTANT: You will do this only for the back, not the front. A problem you may run into with the final result, especially when you do it the first time, is that the sleeve flat fell seam on the right side might end up with unattractive ripples as you can see below from my first shirt. You can avoid this result by using Steam-A-Seam in Step 4. My professor did not tell us to do this. That's just my fix! Below is the right side of the sleeve which, after all, is what counts. It does look pretty good! Sewing books and pattern instructions have you trim the inside seam to 1/8 inch for a flat fell seam. The beauty with the method described in this post is that there is no trimming involved. The seam is stronger and more durable because you have a full 1/4 inch seam inside. On the other hand, the topstitching on the outside is 3/8 wide and you may prefer the 1/4 inch topstitching often seen in jackets, jeans and many other garments which you obtain by using the more widely known method described in the sewing books. Also, the more common flat fell seam produces a seam that can be used on either side. However, there is no right or wrong way. There is frequently more than one way to do things in sewing and I believe that knowing more than one way of doing something is good to have in your sewing arsenal. When you sew your own garments, you have the freedom to choose which technique you like best for the particular garment you want to create. During the Fall of 2012, I took a Men's Shirtmaking class at the Fashion Institute of Technology in New York City. I loved this course. I took it because I noticed that men's shirts are better made and more durable than women's blouses. I think many women's ready-to-wear blouses are flimsy. You have more control over the quality of a woman's blouse when you make it yourself, of course, but I wanted to learn... what was it about a man's shirt that made it look so crisp and polished? In this post, I will share the most novel information (at least to me) I learned in class. They are techniques I do not see described in pattern instructions. My professor told us they are the techniques used in the factories overseas (for the most part - they use a lot less pins and they have specialized equipment to make the super pointy collar and precise sleeve plackets). I found that I have been able to create some high quality professional-looking shirts using the techniques learned in class. Some of them may surprise you! In sewing, there is always more than one way to do something so what I was taught is not the only way and may or may not work for you. Besides using good quality 100% cotton shirting for the shirt featured here, I found that using good quality interfacing is also key to a professional result. I found a medium weight non-woven interfacing designed specifically for collars and cuffs at SIL on 38th Street between 7th and 8th Avenues. It came prepackaged in a ziploc type of bag. You can also find good quality interfacing at Steinlauf and Stoller in New York City. I always test different types of interfacing on scraps of fabric to make sure I like the resulting hand and feel. The interfaced side of the collar and cuffs are the "public" side. In class, I was amazed to learn that you do not use steam when applying fusible interfacing. The professor was emphatic about this and other professors teaching other courses at FIT have said the same thing. The steam creates a water vapor that acts like a barrier to having the glue adhere 100%. 3. What follows is a little bit of MAGIC! It is commonplace to find when you attach the collar stand to the main garment that there is a "jog" or "bump" at the edge where the collar stand meets the front opening of the garment. You can avoid this with a pin! Pin more of the collar stand to the garment neckline edge for a couple of inches, matching the raw edges. Then sew for one inch. Do the same on the other end. Why only one inch? Because you will be tucking in the seam allowance into the collar stand to see how you like the edge. If you don't like it, you have only one inch of stitching to undo and re-do. IMPORTANT: When you sew the one inch, you MUST NOT REMOVE THE PIN. If you do, you will lose the 1/16 inch "mismatch." Do not use the foot pedal when sewing over the pin or you risk damaging the machine or breaking your needle. Hand crank the machine slowly and carefully. I placed a swatch of folded interfaced fabric behind the presser foot as I started to make the foot level with the amount of fabric at the start of the collar stand. The "mismatch" will produce the following clean edge. See how there is no jog or bump! MAGIC. Do the same on the other end. It takes some degree of finesse but I find it is worth it in the end. The first time I did it, I mangled the collar stand so much that the fabric shredded and I had to cut and sew another collar stand and repair the garment neckline edge with a bit of interfacing. I mangled it because I did not make the foot level with the amount of fabric at the end so the feed dogs ate the fabric at the bottom and the needle just pierced the fabric on top in the same place over and over. And then of course I didn't get those nice clean edges so I stitched and unstitched and stitched and unstitched and…. Anyway, I got the above clean edge on this shirt on my 2nd try. 4. Once you are satisfied with the ends, continue pinning the rest of the collar stand to the neckline edge matching the raw edges. Sew along the chalk marking you did previously from Step 2. 5. Once you have completely sewn the collar stand to the garment neckline edge, tuck the seam allowance upward inside the collar stand. Pin along the fold making sure to cover the stitching you just did in step 4 ever so slightly. The folded edge should just meet the stitch line ever so slightly. You see how I caught the back and front with the same line of stitching? That's because I placed the fold "ever so slightly…" over the line of stitching from Steps 3 and 4. It takes some practice. Certainly the first time I did this, I did not have this result. Anyway, I am happy with the results. My next post will address how to sew a flat fell seam inside a sleeve.